Every Friday on this very site we run a piece called 'FFN' which, SPOILERS, stands for 'Friday Fake News'. These FFN stories are of course false and typically have a humorous slant to them. It's just a bit of harmless fun to end the week with, and we always close these pieces by stating that 'none of the above article is true.' However this hasn't stopped some of our readers from being fooled, if they've just read the headline and skimmed through the piece. We have, on occasion, received a "What the hell?" comment to a FFN story that we've posted. The people we have tricked with one of our articles typically just laugh when they realize the story is bogus. One Mexican newspaper, called Récord, took some major heat for a fake news piece they ran this week though. 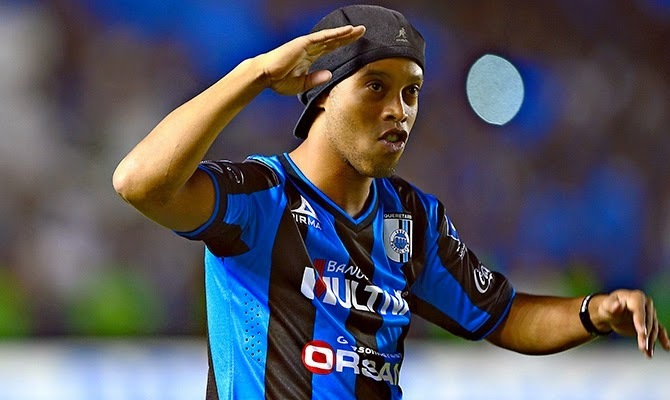 It involved the mercurial Brazilian forward Ronaldinho going AWOL on his club Queretaro. The paper said that he had gone back to Brazil without the club's permission to celebrate New Years in style, but in a move to get him to come back Queretaro's directors were building him a luxury mansion. Ronaldinho's imaginary dream home, that the paper printed plans for, featured an in-house casino, a cinema, an indoor five-a-side pitch, a pool, and a table dancing area. As his clubs fans lost their minds, the editors of Récord were forced to admit that the story was false. The club was not building Ronaldinho a mansion and the buck tooth magician had reported into training as scheduled last Friday.